Replacing The Latch On The RV Screen Door. 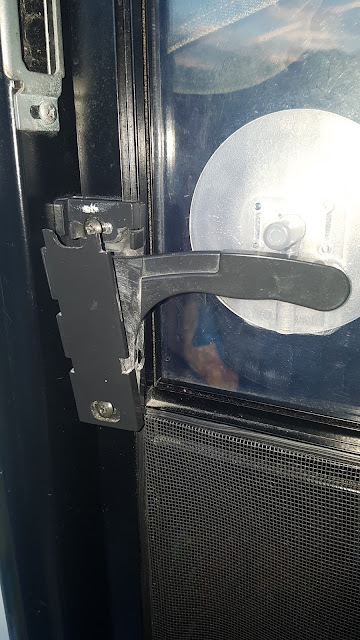 Broken Latch On The RV Screen Door. Stuff happens and this time I guess I'm a bit at fault. I think I might just have slammed the screen door a bit too hard and broke the latch. I'm writing this blog post from Cathedral City, California. We have camp set up at Palm Springs Oasis RV Park. A great park, nice and clean and super nice swimming pools. Back to the darn door. Last year when we were down here I had my head in the toilet, but that's a whole different story. You can read about it on the "Head In The Toilet" post. This one is a pretty easy job, at least I thought so starting out. First, though I called Benlo Co. RV Service and supplies, located in Indio. They are our go-to place down here if we need something. Can't say enough good things about them. Sure enough, they have four different kinds. "Just bring your pice in and we'll see if we can match one up". 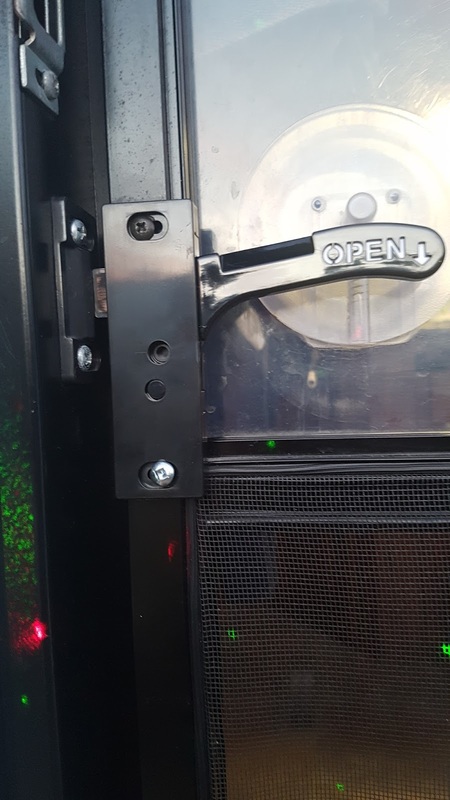 New Latch in Place. Note new self-tapping screw. We drive over to them, about 13 km from the RV Park. We buy one that looks pretty close. Back at the trailer, I start to install the new part and it is just a tad bigger than the old one. One screw is in but I will need to either drill a new hole or use a self-tapping screw. I opt for the later. It works just fine and we are back in business. This is not a hard job to do and in my case, I just needed two screwdrivers to do the job. Cleaning your bathroom fan in your RV is often overlooked. It is important that you get into the habit of cleaning it. If not, you will leave a lot of moister in your RV and then you create a whole bunch of other problems like mold etc. It's a good idea to run your bathroom fan every time you have showers, cook pasta, boil potatoes etc. You know what I mean. It is further important to keep the fan clean for the motor not to work too hard. This is, of course, important when you are boondocking and want to consume less power. We vacuum the screen on the fan every time we vacuum the rest of the trailer. This clears the screen pretty good but every so often you should do a deep cleaning. Since there are many different types of fans each process will be a bit different. likely have a screw through the center of the knob. 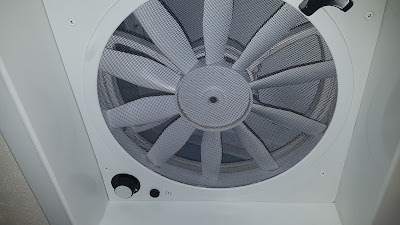 On our fan, the actual screen pops out but for easier cleaning of the fan blades, I like to remove the cover completely. For this you need is a screwdriver, in our case a Philips. Depending on your unit, if it is like mine there is also a screw in the knob that opens the top flap. After you got the assembly removed (it will still be attached to electrical cords) you just need some Windex and a rag. 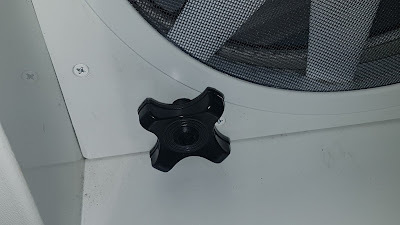 The dirtiest part of the fan will be the top of the fan blade that you can't see from down below. Wet the rag with water and wring it out, then spray down one corner of the rag with Windex get it good and soaked. Now wipe each fan blade. If you have not done this in a while you will have to rub a bit to get it clean. If it's really dirty you may have to rinse your rag out several times and add more Windex. Once you got it all nice and shiny, put everything back together.